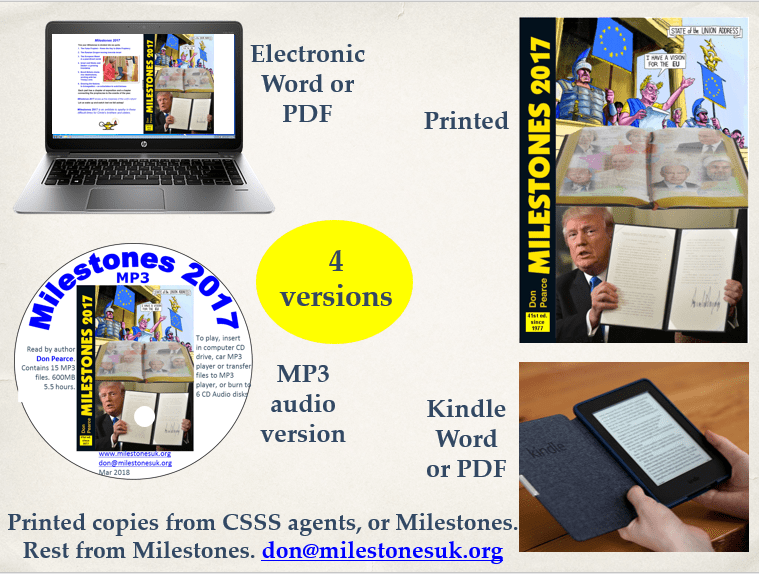 Every 4 months Don writes a Milestones article for the BibleMagazine – in the following months we provide the article free of charge. here is the latest…. Putin wins another six years at Russia’s helm in landslide victory. Britain has found its role in taking on Putin. Russia poisoning is not EU concern, Germany says. Why EU leaders may not be in the mood to hit back hard at Russia over spy attack. The Commonwealth Service: A Celebration of the Commonwealth. Our future lies with the Commonwealth and not the EU. 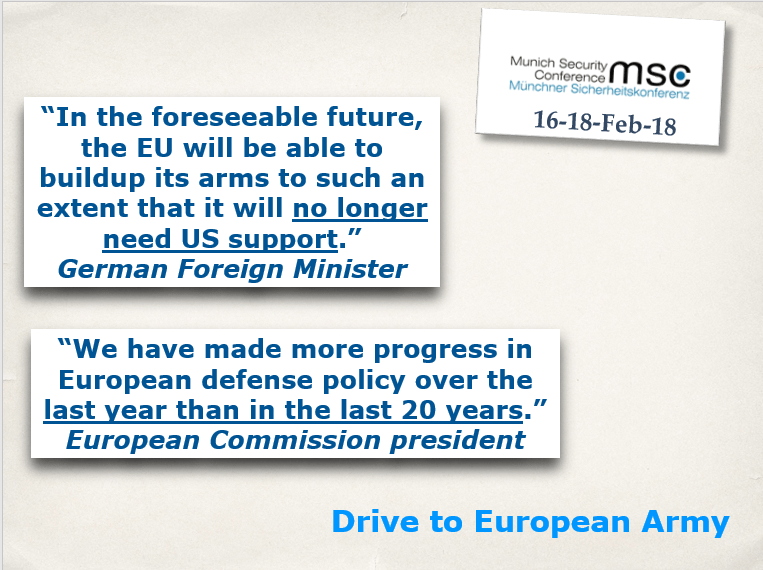 “We have made more progress in European defense policy over the last year than in the last 20 years.”. PESCO – an instrument relevant for the security of the EU and its citizens. What Prince William’s visit means for Israeli-British Relations. History is Made as Israel, Arab States Attend Gaza Conference at White House. The Gas Deal with Egypt: Israel Deepens its Anchor in the Eastern Mediterranean. The world’s political tectonic plates are beginning to splinter under the great pressures being exerted in so many directions. The stage is being prepared by unseen angelic hands for the grand finale in the 6,000-year contest between the thinking of the flesh versus the ways of God. 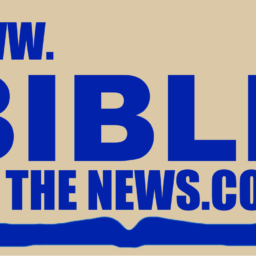 Within the comings and goings of the world scene, Bible students are encouraged by the direction that recent events are moving the chess pieces on the world stage. It will be a time of trouble, fear and destruction, we do not rejoice in this, but scripture teaches us that the ways of man are so astray from God’s ways that to reverse the godlessness of generations will need a display of power and judgements such as we read of in Exodus, that brought about the ending of Israel’s slavery in Egypt. We know that today it is that same focus on Israel that is the key to what is happening in the political world. 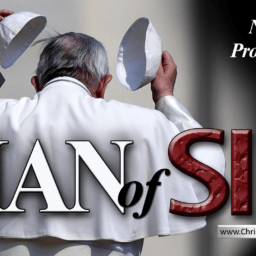 Brought up on a diet of humanism or even a religious background that see the Jews as Christ-killers and so through Trinitarian eyes, God-killers, then the return of Israel to their land is of no real interest. Their claims to the land carry no weight. Whereas Protestant countries, especially those linked through Britain, are influenced in their view of Israel. 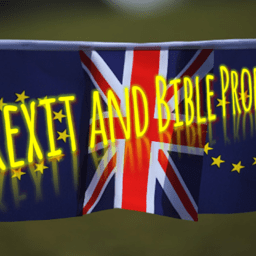 True it is that trade is the great motivating force, but the Biblical background of many of the political leaders gives an added dimension to their dealings. The coming clash takes place in Israel. 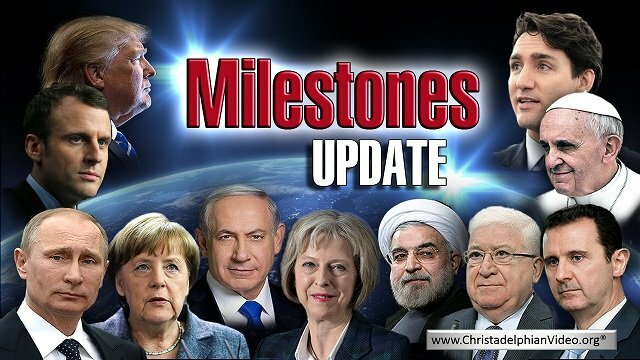 Nations will assemble to attack her, only to be defeated by the newly returned Lord Jesus, Israel’s Messiah and the host of recreated immortal ones gathered from the dust of the earth from past ages will be united with fellow pilgrims who are alive at Christ’s coming. And so we see the grouping of the nations for this final scene prior to the Master’s Return. We see Britain and America being pushed together and away from Russia. Europe integrating politically at a breath-taking speed, whilst not wanting to sever their ties with Russia. At the same time the Southern Arab, Gulf State nations, are increasingly working with Israel. So lets look at these areas. His victory was widely predicted, as all strong opposition had been effectively squashed! Russian President Vladimir Putin won a landslide re-election victory on Sunday (18 March), extending his rule over the world’s largest country for another six years at a time when his ties with the West are on a hostile trajectory. The poisoning of a Russian double agent and his visiting daughter in the normally sleepy town of Salisbury, UK has held the world headlines during the past two weeks. Traced now to a Russian military-grade nerve gas with the code name A-230 developed in the 1970’s and 1980’s by the Soviets, itx is the most toxic nerve chemical ever developed with no known antidote. Neither of the two Russians poisoned with it are expected to recover. Several Russian’s who have fled from Russia because of conflict with Putin have died unexpectedly and it is likely that these previous deaths will be examined for signs of poisoning by this nerve-gas. 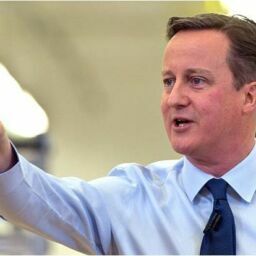 Its effect has been to put Britain and her allies on collision course with Russia. Mrs May has challenged Mr Putin to admit responsibility, which, not surprisingly he refuses to do, drawing attention of the closeness of Britain’s centre for chemical weapons as being only a few miles down the road, accusing Britain of carrying out the poisoning! Mrs May has expelled 23 people from the Russian Embassy in London claiming that those expelled are known to be Russian agents rather than Embassy staff. Russia has retaliated expelling 23 of the British staff – a move that was expected. Her handling of the case was commended—the headline to this section is from the Daily Telegraph 16-Mar-18. The article was written by the former Secretary General of NATO, Anders Fogh Rasmussen. It is early days at the time of writing to see how strongly the West gives Mrs May their support in this matter. 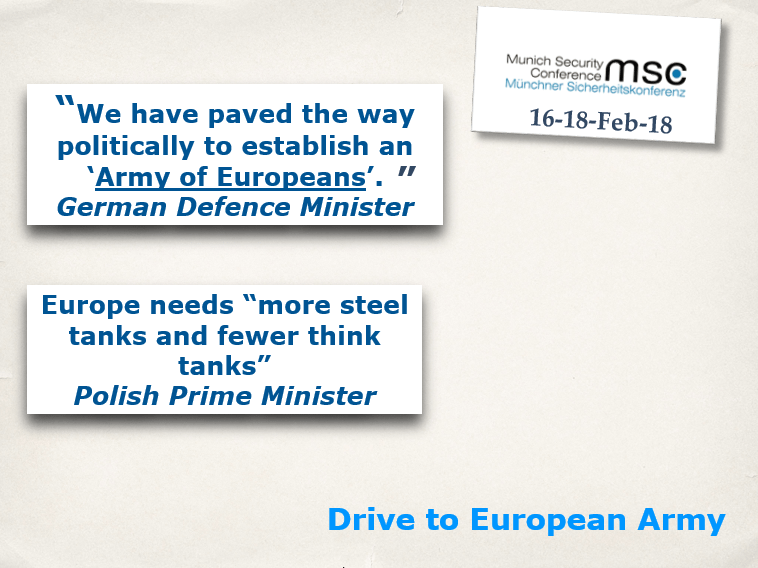 Already the German Foreign Minister has given his viewpoint! Heiko Maas, the German foreign minister, has described Russia as a “difficult partner”, but said the UK poisoning was a “bilateral” issue, indicating that Britain can count on little support from the EU. Maas spoke ahead of a meeting of EU foreign ministers in Brussels on Monday (19 March), one day after Russian leader Vladimir Putin secured six more years in power and in the wake of British allegations that Russia poisoned a former spy, Sergei Skripal, in the UK earlier this month using a form of nerve gas. Germany joined France and the US in backing the UK accusation last week, but Maas added on Monday that “dialogue” with Russia ought to continue as it was “an important partner” in solving international conflicts. Divided interests within the European Union will likely impede a uniform response toward Russia over its alleged nerve attack on former Russian spy Sergei Skripal in Britain. Russia has so far not appeared phased by the U.K. government’s threats of retaliation, which so far consist of the expulsion of 23 Russian diplomats from the country. If you’re waiting for Russia to be firmly punished for its alleged nerve agent attack on a former spy in England, don’t hold your breath. Following several years of what some have criticized as the U.K. government’s overly-lax policy towards Russia, experts aren’t betting on any sweeping measures that would send a ground-shaking message to the Kremlin over its recent behavior. This is, in part, because of the U.K.’s economic ties to Moscow, as well as divided interests within the European Union (EU), thanks to several countries’ heavy reliance on Russian resources. If the Kremlin is testing how far it can push the U.K. and get away with it, it may end up pleasantly surprised. Delivering a uniform response beyond words may prove more difficult. Otilia Dhand, senior vice president at Teneo Intelligence, spoke to CNBC from Brussels about EU leaders’ deliberations. The Brexit talks appear to have been limping along. The EU has no real interest in being helpful to Britain. Its negotiators are afraid of other members seeking to follow Britain’s exit pathway if things are made easy for Britain. The days of the EU being a “Common Market” are long gone, a political union is the goal, to form a United States of Europe. Because the UK is opposed to this, then Britain is showing her opposition to Europe’s aims and so is out of favour with the new dreams of the European elites who control the real power in Europe. The European edifice is a slow-moving creature, proceeding at the pace of the slowest country.,. Everything must be agreed by all 27 members, apart from areas where they allow majority voting to avoid being held up by an “awkward” member or two. It was therefore rather surprising to hear an announcement March 19th that an agreement had largely been hammered out. 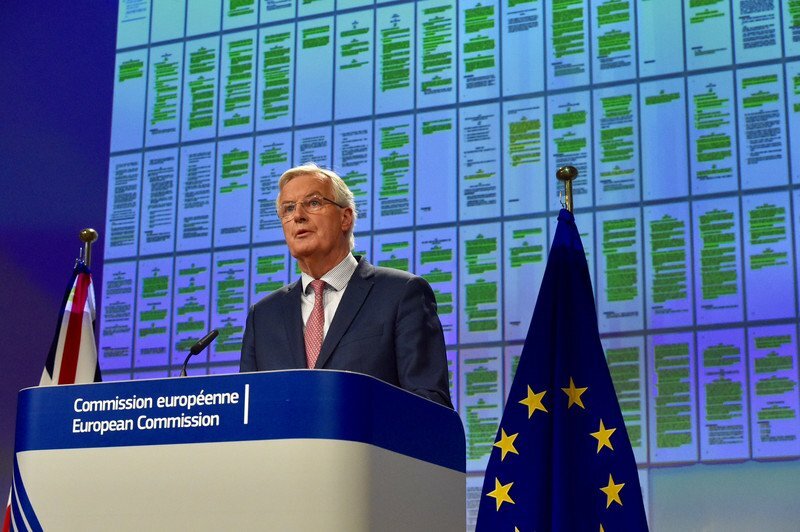 This picture showed the EU negotiator, Michael Barnier, standing in front of a display of the 130 pages of the proposed draft Brexit deal put forward by the EU, with the agreed sections highlighted in green. It looked very impressive! What emerged was a heavy price had been agreed by Britain. And until the last details are agreed there is no Agreement—the non-green items on the pages must be agreed for it to become a reality. As Mr Barnier often reiterates, “Nothing is agreed until everything is agreed”. One of the key stumbling blocks is how to handle the Northern Ireland border with the Irish Republic. Now with both sides of the border being in the EU, the border is seamless and trade flows freely both ways. With Northern Ireland out of the EU, then there have to be border controls. Both sides want to avoid any change in the seamless transition that exists now. Only by electronic data exchange could this be achieved in measure, as happens between Canada and the US, but passport control needs to be in place. One suggestion is to do away with border checks altogether as the trade is relatively small in relation to the UK’s total exports. This would not be readily accepted by the EU as it would potentially allow cheaper goods, not up to EU standards to enter the Republic. Britain appears to have given way on all key matters. If, and it is a big if, the whole document is agreed, then there will be a transition period running from Brexit March 2019 to the end of 2020. 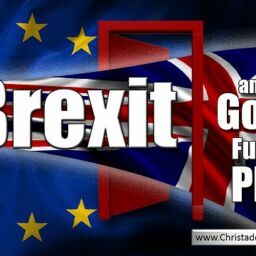 During this time Britain will have to continue to pay into the EU funds—indeed liabilities continue although on a much smaller scale until 2064! 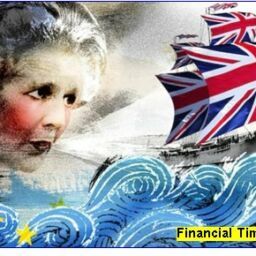 Britain’s fishing grounds would still be subject to EU control until the end of the transition period, and then no guarantee that Britain will be able to take back full control. EU citizens will be able to freely enter Britain during the transition period and have the rights to settle if they wished. There are some gains, the EU has agreed that Britain can negotiate Trade Agreements before she leaves. They would not come into effect until after the end of 2020, but at least the sensible view has been agreed that Britain needs to get in place agreements before she leaves, otherwise she would be left in limbo. She will also not be bound by any EU foreign policy during this period if it conflicts with any “vital interests” of the UK. Mrs May’s natural inclination as one who voted to remain in the EU is to be as close as she can to Europe. 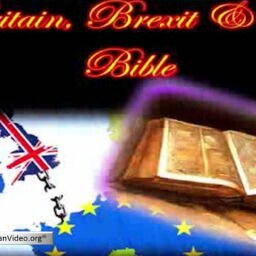 It would appear that God has other plans for Britain, which need her to separate from Continental Europe and forge alliances with her friends outside the EU. Both America and Australia are emphasising that Britain needs to separate from the EU to be able to sign up to Agreements. This was the headline to an interesting article by Ted R. Bromund, who is the Margaret Thatcher senior research fellow at The Heritage Foundation. Last week, I was in Brussels to help launch a new report on financial services in Britain and the European Union after Brexit. During that time, we inched a bit closer to the creation of a free trade area between the U.S. and Britain—and I learned a bit about why the EU is standing in the way. Britain didn’t vote to leave the EU to make itself richer. It voted to leave to get back its right to govern itself. But Europe is a slow-growing part of the world, and that has a lot—not everything, but a lot—to do with bad European policies. By reclaiming its sovereignty, Britain also took back the ability to choose its own path in taxation, labor, regulatory, and trade policies. What the EU is actually afraid of is that Britain will dump a good deal of the EU’s regulatory overhead, keep market access in the EU, and then run off and sign trade deals with a lot of the rest of the world—trade deals the EU hasn’t been able to negotiate. In other words, it fears a competitive Britain. Happily, that’s the way things seem to be headed. Britain has been too slow—far too slow, really—for reasons of domestic politics to make it clear that while it wants free trade with the EU, it plans to diverge from its regulatory model. But it’s now become clear that Britain is going to diverge. That’s good. Without diverging, Britain won’t be able to sign those other trade deals, because it won’t have anything to offer in the deal. As a series of high-level U.S. visitors to Britain have made clear over the past week, if the United Kingdom can’t talk about regulations and agriculture, there’s not much left to talk about, because trade in other visible goods between the U.S. and Britain is already close to free. This isn’t just a U.S. concern. The biggest news of the past week was the invitation to Britain, from the prime minister of Australia, for Britain to join the Trans-Pacific Partnership—the same agreement the U.S. unwisely quit last year. That would bring to Britain free trade with Australia, New Zealand, Japan, and a series of fast-growing Asian economies. This offer refutes the ridiculous claim that no one will want to negotiate with Britain—the world’s fifth- or sixth-largest economy—outside the EU. The Australian offer is to bring Britain into the Comprehensive and Progressive Agreement for Trans-Pacific Partnership, or CPTPP. This has arisen from the ashes of the Trans-Pacific Partnership which collapsed when Donald Trump came to office and pulled America out of the ten-year negotiations. The other participants didn’t give up and the CPTPP is a slightly slimmer version—580 pages long compared to 632. Its members—Australia, Brunei, Canada, Chile, Japan, Malaysia, Mexico, New Zealand, Peru, Singapore and Vietnam—constitute 13.5% of the world economy. The gains will only be a third as much as had been expected under TPP but these are still meaningful. The economies of the CPTPP members will be made 1.7% larger than they would have been, on average, by 2030, according to estimates from the Peterson Institute for International Economics. The biggest winners, in percentage terms, are poorer nations like Vietnam and Peru, who are expected see their economies expand by 2-3% each. And most of these benefits are likely to accrue quickly. Two months after six of the 11 members ratify the agreement, it will come into force. British participation would in effect replace the US, and bring potential gains to the UK, opening world markets in addition to the many Commonwealth countries anxious to do deals with Britain. This is a service held in March every year at Westminster Abbey to mark Commonwealth Day. Her Majesty the Queen, Head of the Commonwealth, will be accompanied by the Prince of Wales, the Duchess of Cornwall, the Duke & Duchess of Cambridge, Prince Harry & Meghan Markle, the Duke of York, the Princess Royal, the Countess of Wessex, the Duchess of Gloucester and Princess Alexandra. The Earl of Wessex, the Duke of Gloucester and the Duke of Kent will be absent from the service due to other commitments. The Commonwealth service is the largest annual inter-faith gathering in the United Kingdom, and it is organised by the Royal Commonwealth Society. The Commonwealth service will be broadcast live on BBC One and BBC World to celebrate Her Majesty’s commitment to the Commonwealth. 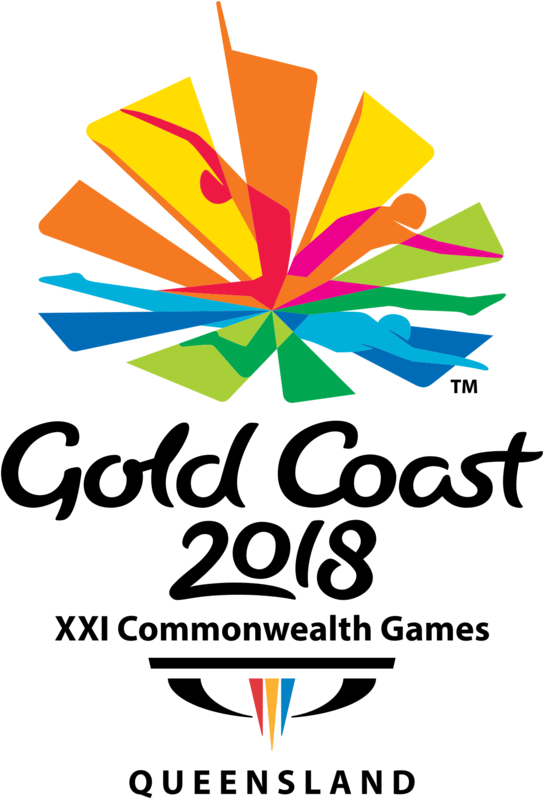 The 4-yearly Commonwealth Games are due to be held in Australia between the 4th and 15th April 2018. It is a very popular event, this year hosting competitors from 70 Commonwealth countries and dependenciesce. Post-Brexit, the Commonwealth will be more relevant and modern than ever. When we joined the Common Market in 1973, we were in effect telling the 33 then members of the Commonwealth where they could go. Instead of treating nations such as India, Tanzania, Singapore, New Zealand and Australia with the respect they deserved as our valued allies, we dumped them in favour of a new European club. And as the Common Market morphed into the European Union and we operated within the customs union, we increased trade barriers against many of them. This is perhaps not the time to reflect more fully on that betrayal of nations which, in our hour of need, dropped everything to come and save Europe from the Third Reich. We repaid them by deserting them in less than thirty years. But let’s not spend too long on the past. Let’s enter instead into the spirit of Brexit and look to the future. Because the very last word you should use about the Commonwealth today is irrelevant. In April, London hosts the Commonwealth Summit which will bring together the 52 heads of the body’s governments. The member countries span Africa, the Americas, Asia, Europe and the Pacific – with a combined population of over 2.4 billion people, making up one third of the world’s population. And 60 per cent of the Commonwealth population are under 30-years-old. It is an amazing, growing and evermore prosperous market. Over the past ten years – long before Brexit – our exports to Commonwealth countries have risen much faster than exports to our fellow members of the EU Single Market, which have actually fallen. We have doubled our sales to Singapore and New Zealand and increased those to Malaysia by 50 per cent. The IMF forecasts that our four current main Commonwealth markets – Canada, Australia, Singapore and India – will each grow faster than the EU, offering fantastic opportunities. These stellar export figures are all, remember, without utilising any of the opportunities presented by Brexit. We do not have a single British-negotiated treaty with any of them, since we are only allowed to be part of EU-wide trade deals. Had we not been in the EU for example, we would have signed a trade treaty with Australia many years ago. Or there’s India, many of whose leading companies are English-speaking. We are the third largest investor in India, and vice versa. The potential for that bond to grow far deeper is huge. But until Brexit we have been unable to sign a trade treaty. Now these opportunities have returned. Indeed, there is now a dedicated Commonwealth desk at the Department of International Trade headed by Liam Fox. It has a team of civil servants working specifically on this trade. Quite rightly, last year Dr Fox remarked that Brexit provides an opportunity “to renew bonds of trade and commerce with our allies across the globe”. 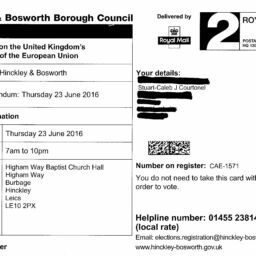 Remember this key fact: 93 per cent of the world’s population are not in the EU. Post-Brexit, the world is our oyster and the opportunities for us to prosper are almost limitless. That means in areas such as South East Asia, for example, where Commonwealth members like Malaysia, Brunei and Singapore can open doors to the whole 650 million-strong region. Our membership of the EU has meant we are far behind where we need to be in cementing trading links with these go ahead areas, where the world economy of the next decades is heading. But our Commonwealth ties give us a great opportunity to overcome that. The Commonwealth is in so many ways our natural home. To be blunt: we have little in common with our European neighbours beyond geography and the history that geography has given us. But we share with our Commonwealth allies a mix of language, common law, parliamentary democracy and culture – not to mention the family and business links. This was the triumphant claim of the EU Commission President, Jean-Claude Juncker, at the Munich Security Conference held 16-18th Feb 2018. This annual Conference in Germany brings together military and political leaders from around the world to discuss pressing security issues. For the European participants there was satisfaction that at last real progress had been made to bring about the final pillar in the building of a United States of Europe—the forming of a European Army. Look at the unfolding timetable since Britain delivered her Brexit letter in March 2017 as shown in the slide. 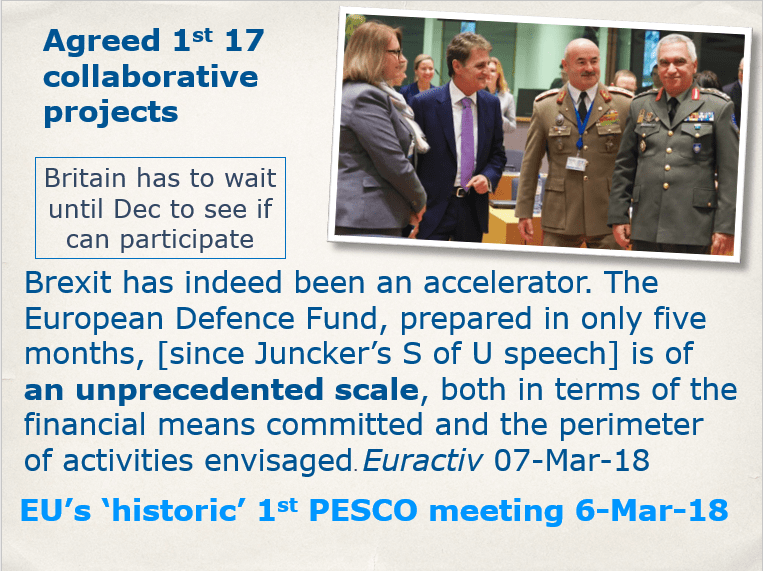 There have been in the past 12 months a succession of statements and meetings, cumulating in the 1st PESCO meeting. This acronym is formed from Permanent Structured Cooperation. It flowed out from Junker’s State of the Union Speech in September and Macron’s speech in the same month. The current set-up whereby each EU member State develops it own version of military hardware and software is very inefficient and prevents, in many cases, cooperation on the battlefield. 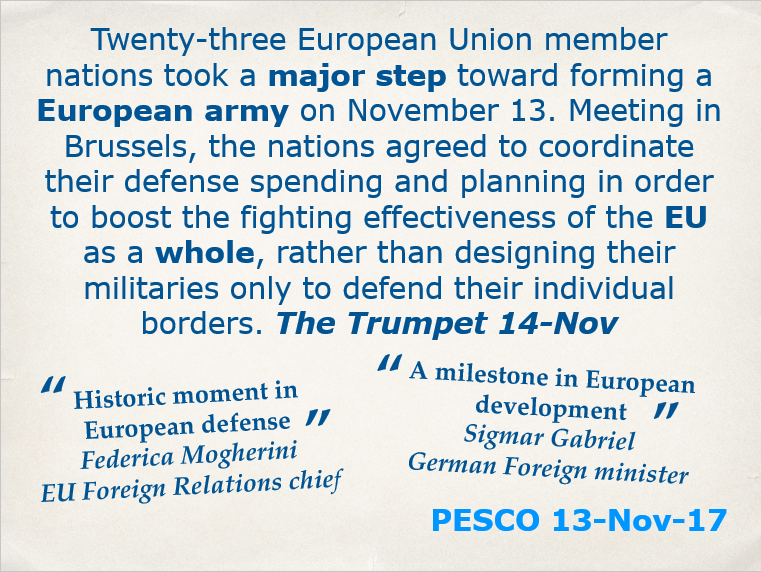 PESCO, inaugurated at the November EU heads of Government summit meeting, pools the EU’s resources and will make identical weapons for all the 25 members that have signed up to it. At their 1st meeting on 6th March 2018 they adopted the first set of 17 different projects and a future roadmap. 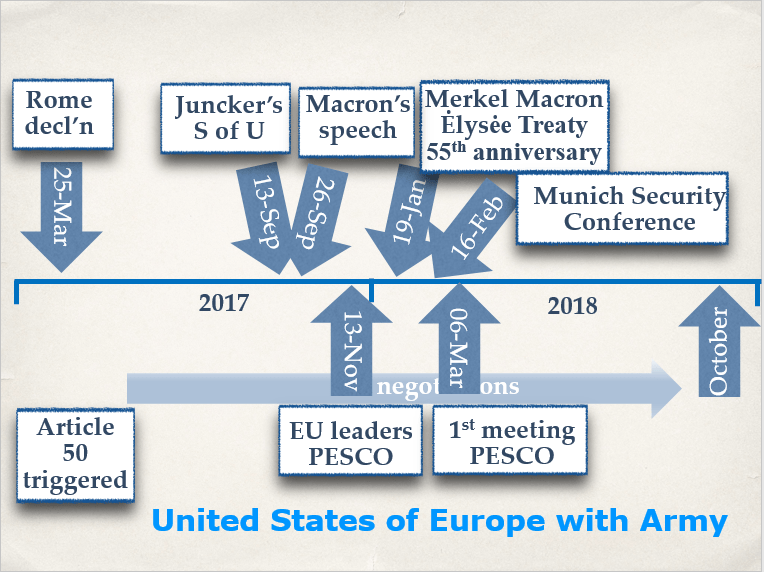 PESCO is both a permanent framework for closer cooperation and a structured process to gradually deepen defence cooperation within the Union framework. It will be a driver for integration in the field of defence. Each participating Member State provides a plan for the national contributions and efforts they have agreed to make. These national implementation plans are subject to regular assessment. This is different from the voluntary approach that is currently the rule within the EU’s Common Security and Defence Policy. PESCO is designed to make European defence more efficient and to deliver more output by providing enhanced coordination and collaboration in the areas of investment, capability development and operational readiness. Enhanced cooperation in this domain will allow decreasing the number of different weapons’ systems in Europe, and therefore strengthen operational cooperation among Member States, increase interoperability and industrial competitiveness. Britain has a large military arms business and although not approving of PESCO would like to be in the running for the supply of military equipment. The matter was discussed at the March meeting, but the 25 PESCO members decided not to give an answer on this question of non-members participating until the end of the year, when it should be clearer which way Brexit negotiations are going. Pesco is Italian for a peach tree; peaches are soft on the outside but have a stone heart! A good analogy for the EU. Let us turn to Israel and the Middle East. As this Jerusalem Post 04-Mar-18 article pointed out, this was the 1st time an official Royal visit has been planned for the 70 years that there has been a State of Israel! It is rather fitting that in this anniversary year this matter should be rectified with a planned visit by Prince William, although the date has not yet been set. The pro-Arab leanings of the UK civil service, perhaps explain why no visit has taken place. Matters have changed considerably with Mrs May and Boris Johnson keen on developing trade between the two countries. 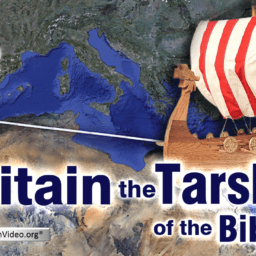 Ties between Israel and Britain are significant on a number of levels. Britain exported goods and services to Israel worth $4.3 billion in 2017. Exports to Saudi Arabia are a few billion dollars higher. But Israel also has much to offer Britain that the Saudis can’t. Israel exported to Britain to the tune of $5.1b. Israel has important technological innovations and the two countries share important intelligence information as well. 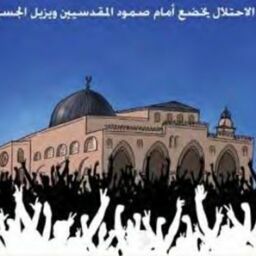 There have been several signs of progress on the acceptance of Israel by the Arab nations, Saudi Arabia in particular. Crown Prince bin Salman stopped off in Egypt on his way to Britain. Here he met with Israel officials. Top Israeli and Saudi Arabian officials reportedly held a series of secret meetings in Cairo last week, ahead of US President Donald Trump’s expected unveiling of his long-awaited Middle East peace plan. According to a report on Israel’s Channel 10 news, a Palestinian Authority official told an Arabic news site on Friday that Egyptian officials were mediating talks that he described as “significant development” in the slowly warming ties between Jerusalem and Riyadh, a trend that he said was undermining the authority of the Ramallah-based Palestinian government. In one of the first visible signs of Israel-Saudi ties, this week, the Saudis granted Air India permission to fly through Saudi airspace to Israel, a first in 70 years. This was followed by a White House meeting to discuss the situation in Gaza. Israel and the US are aware that the only way to win Palestinian minds is to bypass their political leaders and improve their living conditions. President Trump assembled a formidable team to discuss this matter. The Trump administration again made history on Tuesday, bringing together five Arab states [Bahrain, Saudi Arabia, Oman, Qatar, United Arab Emirates. Don] with whom Israel currently has no formal diplomatic relations, as well as Egypt and Jordan – and Israel – all at the same table – in order to discuss how to make life better for Gazans. Also at the meeting were other important stakeholders [Canada, Cyprus, European Union, France, Germany, Ireland, Italy, Japan, Netherlands, Norway, Sweden, Switzerland, United Kingdom, & OPIC. Don] as well as representatives from the United Nations, USAID and the Office of the Quartet. The meeting, convened by White House senior adviser Jared Kushner, brought nearly two dozen nations and international organizations together. U.S. Special Representative to International Negotiations, Jason D. Greenblatt, reported on the current situation in the enclave and said he would present proposals on how to change the situation. Although the world press blames Israel for the situation in Gaza, Hamas is responsible for the diverting of humanitarian funds for those living in Gaza, to military projects. Hamas officials live in luxury, in the main, while the ordinary people suffer. Israel is currently planning a rail link off the Ashkelon-Beersheba line to the Gaza Erez crossing to not only relieve the roads of the heavy congestion, but to dramatically increase the volume of goods shipped to Gaza and greatly reduce the freight costs. In March a $15bn natural gas deal was signed between the owners of the Tamer and Leviathan gas fields and an Egyptian company, Dolpinus Holding. The gas will be supplied over a 10-year period for gas liquification for supply to Europe. This seems a cheaper option than supplying gas by pipeline to Turkey or—a much longer and deeper undersea route to Greece via Cyprus and Crete. The recently developed Egyptian Zohr field, which is bigger than Leviathan, will supply Egypt’s needs; but Egypt has a large plant for liquifying gas for transportation by special sea tankers, which is idle through lack of gas. This would anchor Israel and Egypt. Israel is currently building a gas pipeline to Jordan to handle gas from Tamar and newer fields as they come on stream under a sale of gas agreement signed in 2016 with Jordan over a 15-year period. What exciting times we live in! 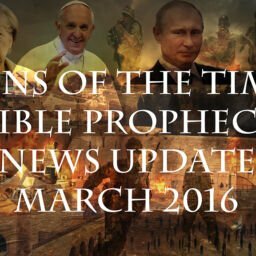 We can see the regrouping of the nations and know that the Master must soon be here. Time and time again, in hindsight we have seen angelic hands holding things back as the time wasn’t quite ready, there were more to be called to the gospel fold. Brexit: UK to leave single market, Britain role as ‘Tarshish’ becomes even clearer. Russia calls for “Partnership of Civilizations” in Europe Russia’s foreign minister lays out Russia’s view of a New World Order….